The Lighthouse, Scotland's first, dedicated, national centre for architecture and design, was opened by HM Queen Elizabeth in July 1999. The Lighthouse is the renamed, £13 million conversion of Charles Rennie Mackintosh's 1895 Glasgow Herald newspaper office. The centre's vision is to develop the links between design, architecture and the creative industries. The building comprises 1,400 square metres of exhibition space. It shows annually 15-20 exhibitions a year, many of which are of international stature. There are three main temporary exhibition galleries, a review gallery and one permanent exhibition space. 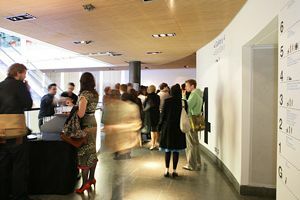 Housed in the impressive Mackintosh-designed building, these modern, diverse and flexible spaces have been carefully designed to accommodate a diverse range of exhibitions. The building houses the Mackintosh Interpretation Centre - the first city centre facility to provide visitors with not only a detailed understanding of Mackintosh's work and cultural significance, but also a helpful guide to key Mackintosh sites in and around the city. The transformation and development of the original Lighthouse building (Mackintosh's first public commission) also features in the centre. Amongst the main attractions are a visually stunning time line wall, showing Mackintosh's achievements, influences and relationships in their social and cultural contexts. 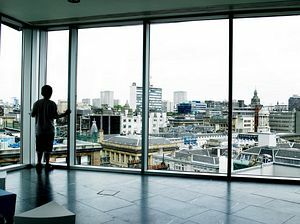 There is access to the Mackintosh Tower, part of the original 1895 design for the building, which offers unique views over the city, taking in such definitive Mackintosh buildings as the Glasgow School of Art and Scotland Street School. Buchanan Street Station, exit to Buchanan Street and follow street signs to The Lighthouse. Queen Street and Central Station are 5 minutes walk away. Buchanan Street Bus Station provides links from within Scotland to Glasgow. Regular bus service from Glasgow and Edinburgh Airports to Buchanan Street Bus Station and Queen Street Station. Trains from Prestwick Airport terminate at Central Station.